Did you have a tough week? 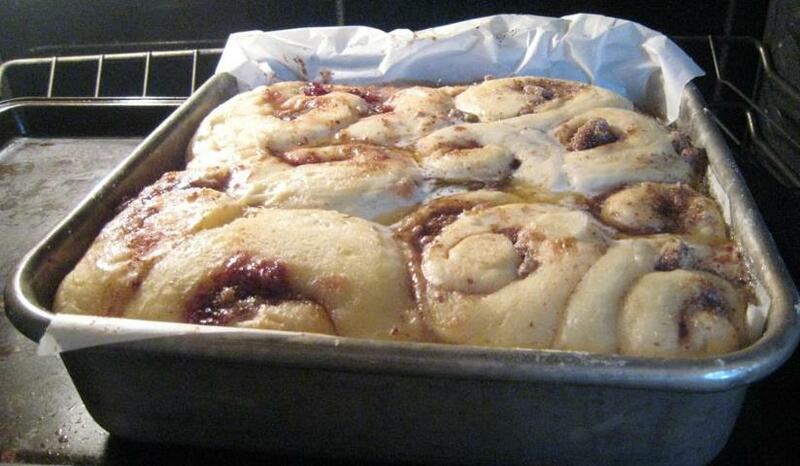 Treat yourself to morning cinnamon buns by throwing together this dough in a mixing bowl and wake up ready to “roll”. You can get away with letting it rise for 8 hours unattended. 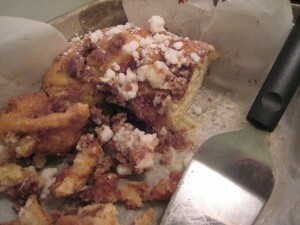 Alton Brown provides a great overnight cinnamon roll recipe. However, you can also follow the method I used below. Disclosure: I have not been paid to endorse any company, blog, brand or product. Quantity: Makes rolls for two 8″ x 8″ square pans. Line 8″x8″ square baking pan with parchment paper. If using ground almonds, toast in a dry skillet for one minute. Allow to cool and combine with 1 egg white and 1 TB of sugar. If you’d like to add cherries to the almonds, stir cherry jam with rum and add to the layer when rolling the buns. 1. In a large glass mixing bowl, combine flour with the cup of sugar with yest, powdered milk and water. Add room temperature eggs and shortening. 2. Allow to rise for two hours. Deflate and re-cover with plastic wrap. Allow to rise for four hours. Deflate. Repeat. 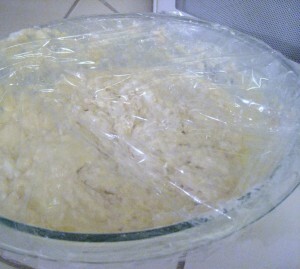 When the dough is ready, it will feel wet and elastic. 3. Flour a board and cut the dough into golf ball sized pieces. Stretch each piece into a rectangle shape. 4. Brush with melted butter. I melt my butter in the microwave for 45 seconds. 5. Sprinkle with cinnamon-sugar and almond crumble. Roll into a snail shape and place onto the parchment paper with the spiral side showing. If you have leftover butter, pour over the top of all the rolls and sprinkle with leftover cinnamon sugar. Bake at 350 degrees Fahrenheit until the rolls have cooked all the way through so no doughy parts remain. If you notice that the top is becoming overly crisp, protect the top with a sheet of oven-safe foil and continue baking. Serve them hot and decorate with your favorite icing. Note: If you make a double batch of dough, you can store one batch in the freezer. Turn a freezer-safe, one gallon zip top bag, inside out. Spray with butter spray. Fill with raw dough and freeze until needed. 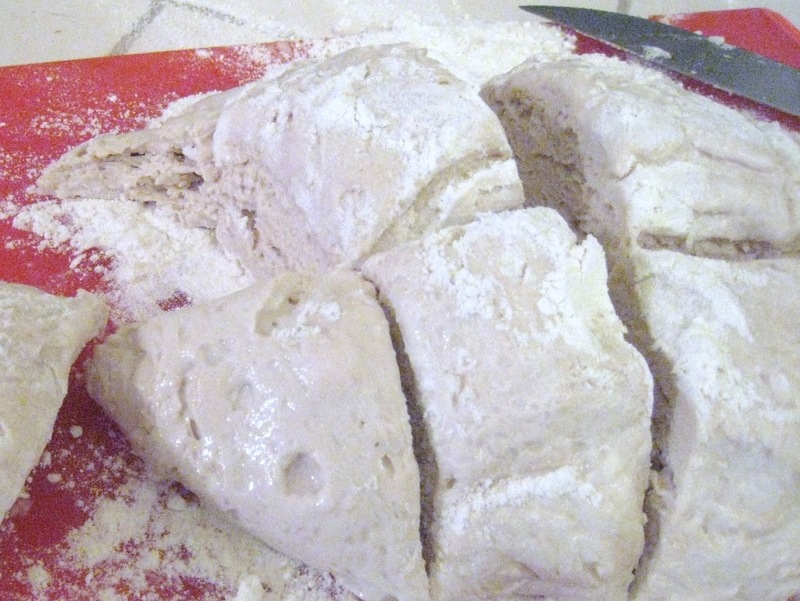 To thaw the frozen dough, bend the block of dough to break off a piece of the frozen dough. Then use the defrost setting on the microwave. Preheat Oven for 325 degrees Fahrenheit. 1. Spray a disposable oven-safe pie pan with butter-flavored spray. Place the portion of defrosted dough onto the tray. 2. Spray top of dough with butter spray. 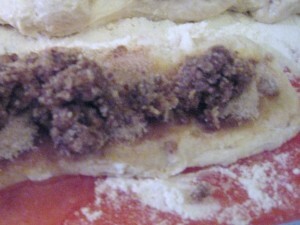 Measure two tablespoons of sugar mixed with one tablespoon of cinnamon to dust on top of dough. I’ve been using the dry maple sugar from Trader Joe’s for my danishes. 3.Cover with foil and set on a cookie sheet. Bake for 20 minutes. Spread the baked pastrywith icing while warm. Note: True danishes have a lovely rich cream cheese based filling but if you are lactose intolerant like me, a drizzle of light sour cream icing is easier to digest. Contact me if you have a good icing recipe. 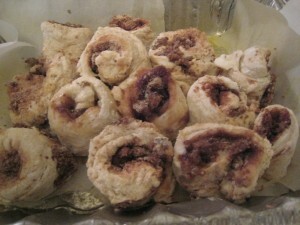 You can find alternate cinnamon roll recipes on About.com. I brought a double batch to a church potluck for Cornerstone West Los Angeles this Sunday. What’s on your breakfast menu for next weekend? I use this to target prospects for linkbuilding as a SEO copywriter, blog writer and digital content producer. This means that I use these tips to write my “query letter” or emailed guest blog post pitch to bloggers. These tips also seem to work in landing job interviews. I read this in 2008 when I interviewed for a buyer position in supply Chain and again this month when I was offered a Logisitics job for a manufacturing company. I laughed out loud like I did when I read The Goal. What classroom textbooks have you found useful in the work world? The Leadership Challenge by Kouzes and Posner have been valuable to me as an individual contributor and as a manager in the five years after business school. 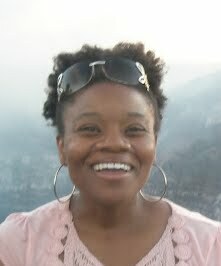 Disclosure: I have not been paid to promote any company, product, blog, book or school. 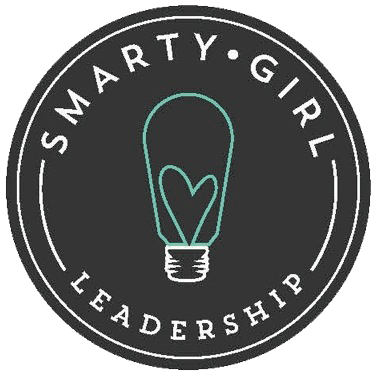 Out of the Five Practice of Exemplary Leadership, my classmates said that I excelled in encouraging the heart, inspiring a vision and enabling others to act. I would like to develop as a leader in modeling the way and challenging the process. Contact me if you’ve applied The Leadership Challenge practices as a middle manager, as a public speaking club officer or at church. In the meantime, I am encouraging girlfriends to influence others and exercise their innate leadership in writing tutorials for successful business women. A leader is part coach. Wouldn’t you agree? My style is to begin with encouraging the heart. Though you may expect Ed Brodow’s Negotiation Boot Camp to instruct you to talk others into submission, it taught me to become a better listener. This works during second level job interviews with the hiring manager as well as when your spouse may need to vent about his or her day. It is true that the other doesn’t care what you have to say until he believes you care about him. Ed Brodow suggests that if you are listening 70% of the time and speaking for only 30%, that the other party will perceive that you are being respectful. This increases their perception of your likeability and trust follows. 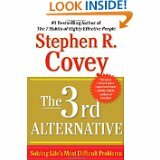 The 3rd Alternative by Stephen R. Covey reminds me of the Negotiations seminar by Leadership Professor Dr. Joyce Osland. She said that two parties fighting over pie slices do not recognize that the size of the pie can increase. In other words, the pie may be larger than what both parties think. 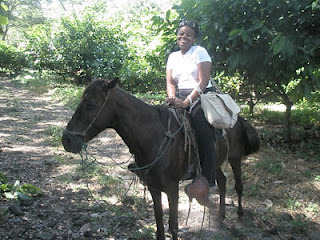 I gave a glimpse into one of her business negotiation simulations here. Thank You for Arguing by Jay Heinricks will remind you of Eliyahu M. Goldratt’s The Goal because the author uses personal anecdotes that will remind you of the The Goal’s protagonist’s interaction with his teens, wife and coworkers. Yes! 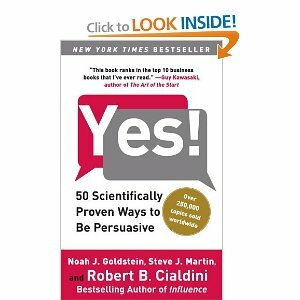 : 50 Scientifically Proven Ways to Be Persuasive by Robert Cialdini seems to be the best book out of this list if you have 15 minutes per day to learn more sales negotiation strategies or attracting new visitors to your website. For instance, he mentions research that shows that those with the same first name as you may be more receptive to your sales pitches. I’ve found a similar phenomenon on Pinterest where people are eager to follow Pinners by the same name. In some cases, they share similar tastes in home decor. Uncanny. 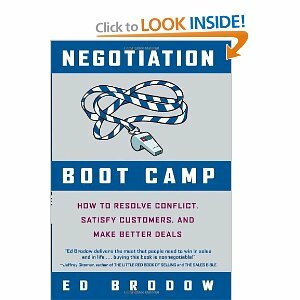 Negotiation Boot Camp reads like a manual. It answers what traps to avoid and common strategies to use if you are buyer for supply chain or a consumer shopping for a car. Talk with your friends about this title but don’t let your “sparring partner” know you are reading it. The 3rd Alternative is less popular than The 7 Habits of Highly Effective People by the same author. Don’t expect this book to be a natural conversation starter like The 7 Habits. In contrast to encountering a blank look when you mention The 3rd Alternative, you can bond instantly with another reader of The 7 Habits outside of your industry. In my graduate school dorm, a Masters in Library Science read The 7 Habits as part of her required reading while I read the same book as supplementary reading as a MBA student. I would say that though The 7 Habits is a course all its own and wildly popular, The 3rd Alternative can be understood and applied without reading the former. Just as The 3rd Alternative can be useful without its more popular sibling, The 7 Habits. 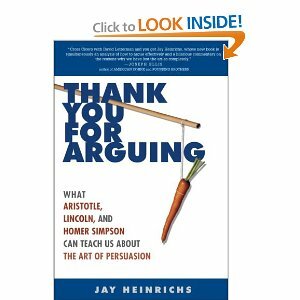 You can enjoy Thank You for Arguing by Jay Heinricks without reading Eliyahu M. Goldratt’s The Goal. However, in the case of these two books, I recommend you read them concurrently. The Goal gives tangible operations problems and personal conflicts that aid with the understanding of Jay Heinrick’s lessons. Sure, The Goal is fictional but it helps illustrates man of the truths in Thank You for Arguing. If you are looking for instant gratification, you get pretty close to it by applying Robert Cialdini’s Yes! : 50 Scientifically Proven Ways to Be Persuasive. Tips from Negotation Boot Camp take more finesse to apply. I’ve used Ed Brodow’s tips to negotiate the price of a dental exam. In contrast, I received three job interview offers, in one afternoon, by applying just two of the tips from Cialdini’s book of Yes! The return on investment (ROI) is high for Yes! techniques and the rate of return is quick. For example, I applied to online job openings at 10:15 A.M. and I received three phone calls from hiring managers by 4 P.M. the same day. Which one of these books is for you? It depends on your objective. What do you need? What argument do you need to settle? How many people do you need to persuade? What’s your timeframe? If you are a successful business woman who does not like to be involved directly in sales, beef up your reading list and find out what bothers you about interactions in sales. You may identify new ways to train your sales team. 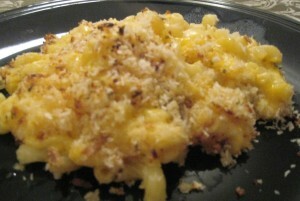 Alton Brown’s stovetop and baked macaroni methods work so I combined the two to make my own. My first taste Western food, as opposed to Chinese food, happened in nursery school. I still remember the tiny spoonful of baked mac and cheese served in a tin cupcake liner. After one taste, I refused to go out to play and demanded a second cup. I didn’t get that cup. That was a good move by the nursery school teachers not to indulge me. Otherwise I would have been a brat and demanded mac and cheese all the time at the school. Disclosure: I have not been paid to endorse any company, brand, product or blog. 1. Boil the pasta in water for 6 minutes according to instructions on pasta package. Drain. 2. Melt 2 sticks of butter on stovetop. Add hot sauce, onion and 2 tsp of seasoning salt. 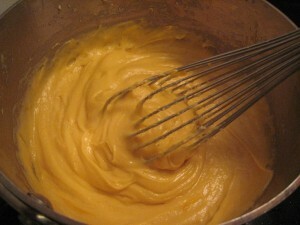 Whisk with flour into a roux. Add evaporated milk. Whisk until smooth. Turn down heat and stir in cheese. Turn off heat. This will make a super thick cheddar sauce. 3. Line a 3″ deep casserole dish or disposable foil baking pan with parchment paper. Preheat oven broiler to High. 4. Layer drained elbow mac. 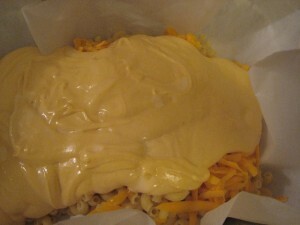 Add thick cheddar sauce on top. In a separate bowl, melt 1/2 stick butter and combine with panko, fried onions and chervil. 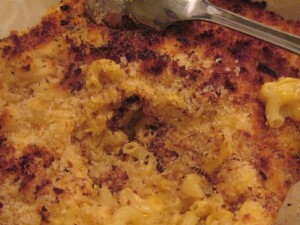 Layer crumbs on top of sauce. 5. 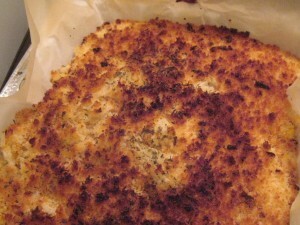 Watch carefully and broil for less than 10 minutes until crumbs are browned. Serve with grilled diced ham. Note: If you want better binding between panko, cheese sauce and pasta noodles follow Alton Brown’s advice and add one egg. You can eat it in a bowl with a spoon and feel like a kid again. 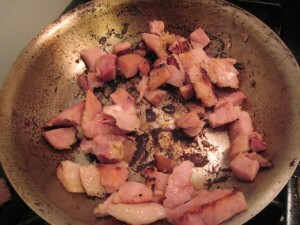 Avoid sprinkling diced ham for mac and cheese for vegetarian guests.